Tis the season to be merry, bright and a little bubbly, meaning sparking wine cocktails, of course! 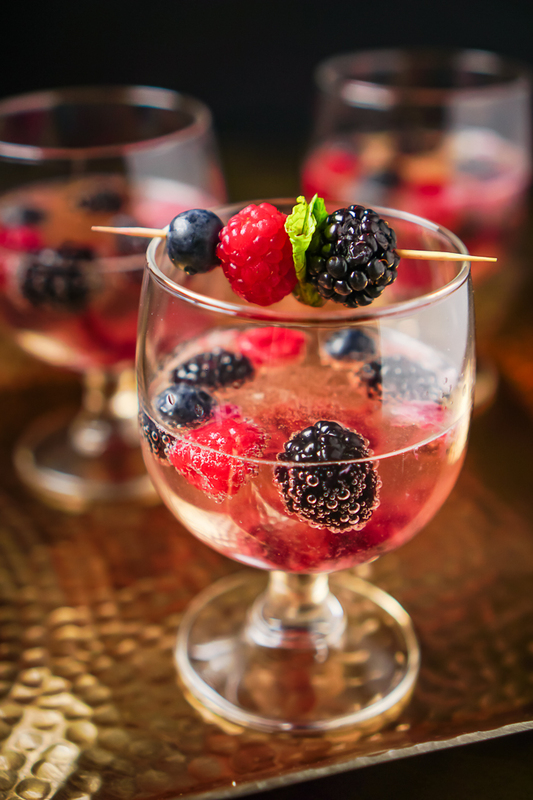 This Berry Champagne Cocktail is lightly sweetened with blackberries, blueberries and raspberries and makes a gorgeous first impression for your holiday celebration. Just think how pretty your midnight toast could be with this as your New Year’s Eve cocktail! 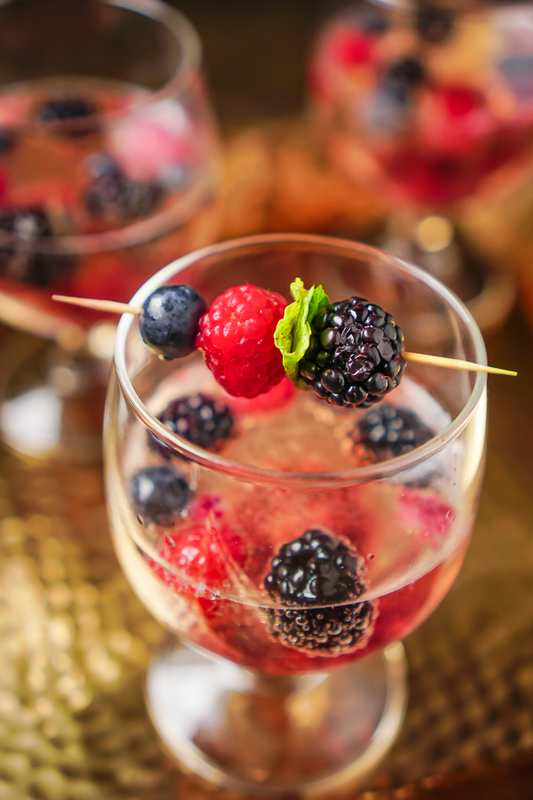 TOAST THE NEW YEAR AND HOLIDAY CHEER WITH THIS GORGEOUS BERRY CHAMPAGNE COCKTAIL RECIPE! Since the beginning of our relationship, Bryan and I have always spearheaded New Year’s Eve celebrations. It was never a big deal in my house growing up, but I loved having a fun excuse to get our friends – our chosen family – together for a cheerful holiday celebration and a fun excuse to make pretty drink recipes like this Berry Champagne Cocktail! Whether hosting our Minnesota friends at his parents’ house or hosting just our closest friends here at home, we love hosting a New Year’s Eve party. In the past, I’ve always gone all out when it came to appetizers or even full meals, but I’ve never done a special New Year’s Eve cocktail before. We’ve just popped the bubbly and poured. I decided it was time to step up my cocktail recipe game and craft new champagne cocktail recipes. It actually started with my White Christmas Sangria and it definitely did not end with this Sparking Berry recipe. My favorite thing about this drink recipe is how pretty it is! The dark pink color you get from cooking down the berries is gorgeous mixed with sparkling wine or champagne. It’s definitely a gorgeous drink to toast in the New Year with! 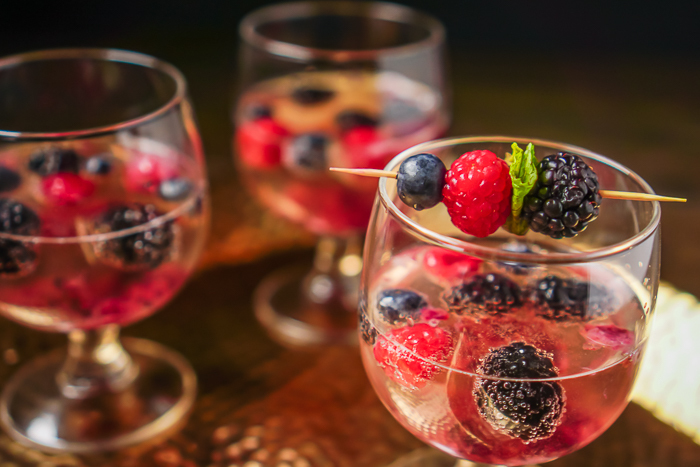 Plus, I garnished the champagne drink with berries to a toothpick in addition to a little sprig of mint for a pop of contrasting color to finish the entire look. I chose mint because I love how it pairs with the fresh berries. This gorgeous and flavorful three berry syrup is made with raspberries, blackberries and blueberries. You can easily switch out the berries to meet your own personal preferences. However, I will say that you can’t taste any of the individual berries once they are all cooked down together. In a medium saucepan, you will combine the berries, vanilla, sugar, and water. Bring the mixture to a boil and reduce heat to low, simmering for 10 minutes. Then, add the mixture to your blender or food processor and blend until smooth. If not thin enough, you can add a little more water and blend again. TIP: I do not find any seeds prominent in this Three Berry Syrup. However, if you have an aversion to seeds, you can push the mixture through a mesh strainer before cooling. Set aside your syrup to cool to room temperature or place into refrigerator. Place your berry syrup into an air tight container and store in the fridge for up to two weeks. This comes in handy because it means you can prep this berry syrup ahead of the holiday or event. When serving a champagne cocktail, you’ll need pretty coupes or gorgeous champagne flutes! I also love these Recyclable Stemless Champagne Flutes for larger parties; they are really nice looking for plastic glassware, making it perfect for big parties. We are all about having a champagne stopper in the house so opened bottles don’t go to waste! Having a nice glass pitcher to make large batches as well as a beverage stirrer are always great for holiday cocktails. If you want to make this as a large batch cocktail for your holiday party, just wait to pour the champagne until you’re ready to serve. Cheers to a Wonderful Celebration with this Sparkling Berry Cocktail! Toast your holiday festivities with a Berry Champagne Cocktail. Lightly sweetened with blackberries, blueberries and raspberries with a gorgeous first impression for your holiday parties. Add mixture to blender or food processor and blend smooth. Set aside to cool to room temperature. Berry Mixture can be refrigerated for up to two weeks. If you have an aversion to seeds, you can push the mixture through a mesh strainer before cooling. I did not personally notice any. Add 1-2 tablespoons of berry mixture to a champagne glass. Fill with sparkling wine or champagne. Garnish with your favorite berries and a small piece of fresh mint if you would love a splash of color that goes well with the berries! The Berry Mixture could make up to 15 drinks depending on how much you put in the glass.